Nail injuries are often associated with damage to other structures that are in the same location. These include fractures of the bone (distal phalanx), and/or cuts of the nail bed, fingertip skin (pulp), tendons that straighten or bend the fingertip, and nerve endings (see Figures 1 and 2). Figure 1. 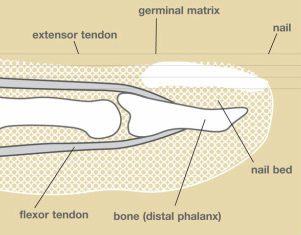 The anatomy of the nail bed and surrounding structures. Figure 2. 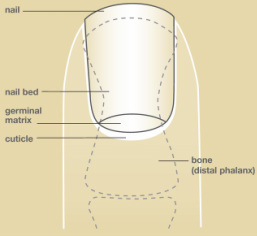 The anatomy of the nail bed and surrounding structures from a lateral view. Many nail bed injuries result from crush injuries after getting the fingertip caught in a door. Any type of pinching, crushing, or sharp cut to the fingertip may result in nail bed injury. An accurate history of the cause of the nail bed injury should be obtained. X-rays are recommended to look for associated fractures that may require treatment. The full extent of the injury may not be evident until adequate anesthesia (usually local) is given and the nail is examined with magnification. After nail bed injury, restoring the normal anatomy of the nail and surrounding structures is the goal of treatment. Simple hematomas are drained by making a small hole in the nail in order to relieve the pressure and provide pain relief. Straightforward cuts are repaired to put the parts back where they belong. Repairing the nail bed to which the fragments of bone are attached usually restores alignment of many fractures of the fingertip. Larger fragments of bone may need to be pinned or require splinting to heal the fracture. Missing areas of nail bed can be grafted from the same finger or from other digits. Tendon injury may require splinting or pinning. Local flaps of skin may be used to replace missing skin, or the open area of skin may be allowed to just heal on its own, or covered with a skin graft. The final appearance and function of the nail and surrounding structures depends on the ability to restore the normal anatomy. If the injury is sharp and can be repaired, a normal nail is likely. If there is more severe crushing, nail bed injury, then there is a greater likelihood of nail bed scarring and subsequent deformity of the nail. If the germinal matrix (crescent-shaped zone at the base of the nail bed from which the nail grows) is injured, there will likely be a deformity of the nail as it grows. The function of the fingertip also depends on the extent of injury to structures other than the nail. It normally takes 3-6 months for the nail to grow from the cuticle to the tip of the finger.